Vote for Campaign of the Year! It’s Valentine’s Day (at least for a few more hours), so what better time to get you to express your love for the campaign you believe should be Campaign of the Year for 2018! Also in the spirit of love, we’re taking this opportunity to right the tremendous wrong from last year, when the hard working GMs and players of the 2017 Campaign of the Month roster were denied their Campaign of the Year vote. That’s right, this year’s CotY voting is a double header. We simply couldn’t bear the thought of letting another day go by without getting our beloved featured campaign program back up to speed, and our winners determined. So please, join us in casting a vote for both the 2017 and 2018 Campaigns of the Year. Vote for 2016’s Campaign of the Year! At long last, the time has come! It has been a long time coming, but the wait is finally over! Yes, that’s right, the moment is at hand. You’ve watched, and waited (and waited), and probably wondered if this was even happening… and in return for your patience the Selection Committee would like to extend our most sincere gratitude, and our most humble apology. As part of this particular Campaign of the Year offering, we’re taking the opportunity to include the lone Campaign of the Month from 2015, which – due to the temporary halt in featured campaigns – was never given the chance to appear in an end-of-year vote. Though a little unorthodox, the Committee feels strongly that it’s the right thing to do, and serves to get us “caught up” as it were. So without further delay, here we go! What in the hell is going on here? Are those things dice? Evil cuboids? Primitive Modrons? Who is this guy, why is he in the cauldron? Where is this happening? All things to think about when submitting your captions to us! Tell Us About Your Character Contest! We all love to tell stories about our characters, don’t’ we? Too bad no one ever really likes to hear them though, and while this is true most of the time – this is not one of those times! 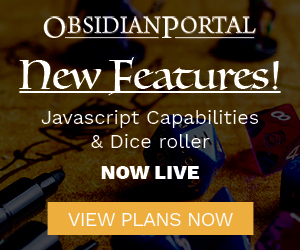 In partnership with AwesomeDice we are running a contest where two lucky winners will win a set of dice of their choice and a very exclusive Obsidian Portal dice bag! Want in? Listen up and we’ll tell you how. Fiasco – One Hell of a Good Time, and Giveaway! Congrats to Zorana on winning the Fiasco contest! We hope you enjoy all your Fiasco goodies and the hours of enjoyment to soon follow! Please, everyone feel free to keep commenting and discussing the game in the comments below! During our last day at Gencon, Micah and myself were pulled into a game of Fiasco by Danny Rupp of Critical-Hits (aka @Bartoneus the Architect DM) along with about a dozen other folks, we wound up with 4 full tables of games going on. While neither Micah or I were honestly too keen on the idea of playing at first, I’m fairly certain the experience was some of the most fun we had during the whole convention and I’m very glad we played.